• A 56-by-29-foot high-definition scoreboard. • New exterior paint and new graphics. • New paint in interior concourse. • Shaded party deck areas along right and left field. • An updated weight room. 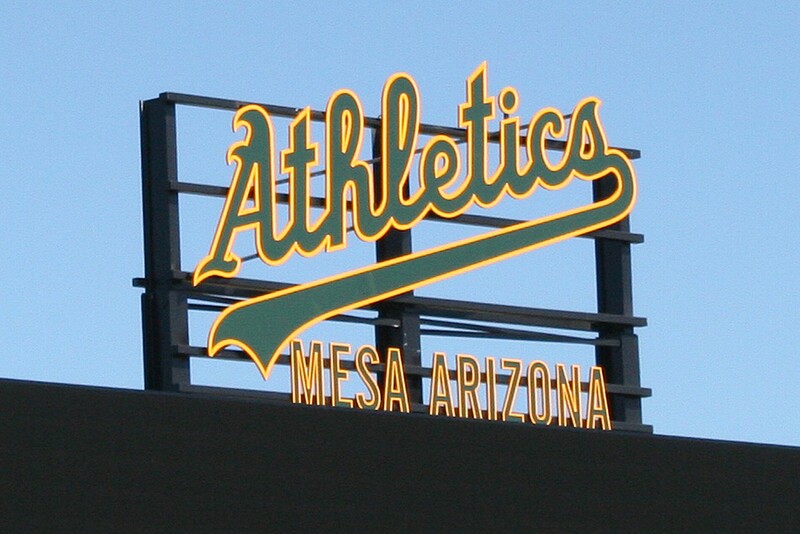 MESA – The Oakland Athletics’ new spring training home at Hohokam Park features an upgraded clubhouse, a high-definition scoreboard, new seats and shaded party decks. Developers gave team officials and Mesa leaders a tour of the stadium Wednesday as well as showing upgrades to minor league training facilities nearby in Fitch Park. In all, the project will cost $26.9 million with Mesa providing up to $17.5 million and the team putting up the rest. Built in 1997, Hohokam Stadium was home to the Chicago Cubs until the team moved to brand new Cubs Park, also in Mesa. The A’s signed a 20-year agreement with the city to relocate from Phoenix Municipal Stadium and will play their first Cactus League game here next year. Team President Michael Crowley said the Athletics have been working with the city for about a year now to make the stadium their own. “It’s an unbelievable facility and one we can be proud of, both us and the city of Mesa,” Crowley said. Other improvements to the facility include an expanded clubhouse weight room and new paint on the exterior of the stadium and the interior concourse. Crowley said the renovations to Fitch Park were more extensive because building up the minor league facilities sets the team up for the major league success. Used year-round for player development, the park has a new weight room, training rooms, classrooms, kitchens and meal areas as well as renovated fields, batting cages and pitching mounds. The Athletics have made the playoffs for three straight seasons, and team owner Lew Wolff said the new facility will build on the team’s successes. “It moves us to the new level of what facilities you need to really attract and retain ballplayers,” he said. And Wolff said the team is looking to do a lot more from Mesa now. This isn’t the first time the team’s spring home was in Mesa. The Athletics played at Rendezvous Park here from 1969 to 1978, during which the team won three consecutive World Series titles from 1972-1974. 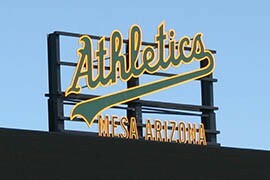 Mesa Mayor John Giles said memories of those years make him more excited for the city’s partnership with the A’s. 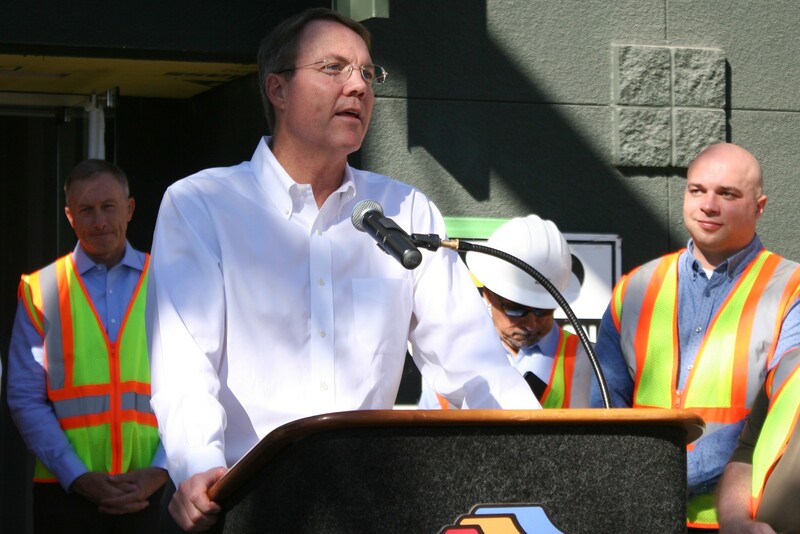 Giles said he is excited for the financial benefits the A’s will bring to Mesa, but it’s the benefits to the community he is more excited about. Officials said the work on Hohokam Stadium, for decades the spring training home of the Chicago Cubs, more than a rehabilitation but new construction as it prepares for its new tenant, the Oakland A's. Cronkite News' Colton Krolak details the project. 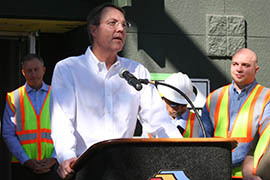 Team President Michael Crowley said the Oakland Athletics have been working with Mesa for about a year now to make the Hohokam Stadium and training facilities in nearby Fitch Park their own. 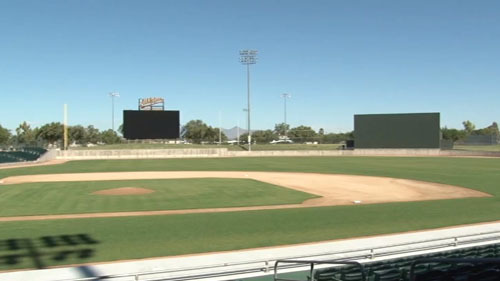 Upgraded Hohokam Stadium features a new high-definition scoreboard. 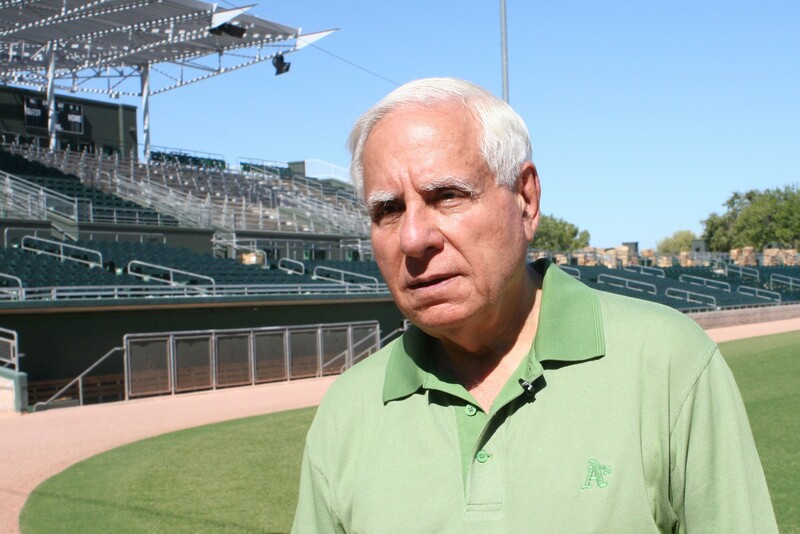 Team owner Lew Wolff said the Oakland Athletics' new facilities in Mesa will build on their successes.